Marilyn Maxwell; died Feb 4 2012; married -- Grissom. William Maxwell; married Mary Ann -- (children: Gregory, Brian, and Benjamin Maxwell). Maxwell, John, head-of-household, age 31, born in Indiana; completed 4 years of college; on Apr 1 1935 was living in the same place/township; owned home ($6000 value); occupation: engineer, electrical; worked 52 weeks in 1939; $2280 wages in 1939. Maxwell, Florence, wife, age 25, born in Indiana; completed 4 years of college; on Apr 1 1935 was living in the same place/township. Florence Hinshaw Maxwell 99, Indianapolis, passed away March 13, 2014. She was born in Nora Indiana on July 14, 1914 to Asa and Bessie Gertrude Hinshaw. She received a BA from Butler University in 1935 in French and Spanish education. Florence was a homemaker and civic worker. 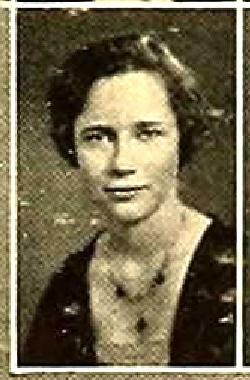 She was a member of Delta Gamma sorority, North Group Women's Committee of the Indianapolis Symphony Orchestra, Indiana Audubon Society, Indiana Historical Society, and a number of vision-related organizations including the former Prevent Blindness Indiana. Florence received many awards and honors that are chronicled in "Who's Who in the Midwest," including the Key to City of Indianapolis and the Jefferson Award for Distinguished Public Service. For the Indianapolis Alumni of Delta Gamma Founders Day 2012, she was recognized for 80 years with Delta Gamma. In addition to her many volunteer activities, Florence loved bird watching, flower gardening, and classical music. She enjoyed accompanying her husband John on his international business travels to see other parts of the world. When she was raising her family, she enjoyed supporting their youth activities as a volunteer such as in scouting. Florence was preceded in death by her husband of 65 years, John Williamson Maxwell, and her daughter, Marilyn Maxwell Grissom. She is survived by her son, William Maxwell (Mary Ann) and three grandsons, Gregory, Brian, and Benjamin. Funeral service is at 11:00 a.m. on Saturday, March 22, 2014 in Leppert Mortuary Nora Chapel, 740 East 86th Street, Indianapolis, with visitation prior from 10:00 a.m. to 11:00 a.m. Burial is in Union Chapel Cemetery, Indianapolis. 1920 census, Washington Township, Marion County, Indiana; roll T625-450, ED 18, page 3A, line #16, dwelling #59, family #59. 1930 census, Indianapolis, Marion County, Indiana; roll T626-610, ED 453, page 9A, line 17, dwelling #433, family #445. 1940 census, Washington Township, Marion County, Indiana; roll T627-1076, ED 49-54, page 5B, line #56, household #109.